Everyone wanted to pour his wine, to sit near him at the table. Me too. Until he was dead. Then he was with me all the time. Jesus Christs, A. J. Langguth’s little-known novel published in 1968, imagines Jesus turning up in a wide variety of situations both ancient and modern. In a series of short narratives, he’s a schoolboy, a prisoner, a Vietnamese soldier, a talk-show host, a priest, a prophet, and a host of other characters. Not limited to his biblical incarnation as a first-century Jew, he exists as a recurring phenomenon with an innate awareness, if not always complete understanding, of his unique nature and demanding vocation. Despite being thrown into a new time and place every page or two, the multiple Jesuses retain a semblance of self-recognition within the flux of ceaseless improvisation. But over the course of the novel, the struggles and hopes of all those Jesus Christs begin to seem indistinguishable from our own. Langguth’s pluralizing of Jesus explores Gerard Manley Hopkins’ premise that “Christ plays in ten thousand places,” wearing many faces, as if the Incarnation were not a singular event but a series of experiments––not only in the range of human possibilities, but in the very feasibliity of translating divinity into the syntax of creaturely dilemmas. Some of these experiments fail in sad or funny ways, but the ongoing repetition of the attempt suggests that there may be something––or Some One––whose desire for human flourishing remains eternally persistent. Langguth’s quirky novel first appeared when I was a young seminarian immersed in biblical studies, and it had a lasting impact on the way I think about both the representations and the manifestations of the living––that is to say, ever-recurring––Jesus. The One who changes everything keeps coming again and again, and “the holy gospel according to us” not only reframes the way we understand our own stories, but the way we re-read the original biblical texts. Jesus lives, and so does Scripture, and the thing about living things is, they can’t be pinned down or dissected into fixed and final meanings. They keep surprising us with new revelations. All this came to mind when I discovered, during Easter Week, Marie Howe’s Magdalene, a luminous and moving collection of poems in which two biblical figures, Mary Magdalene and Jesus, assume new identities in the deeply felt narratives and perceptions of a contemporary woman. 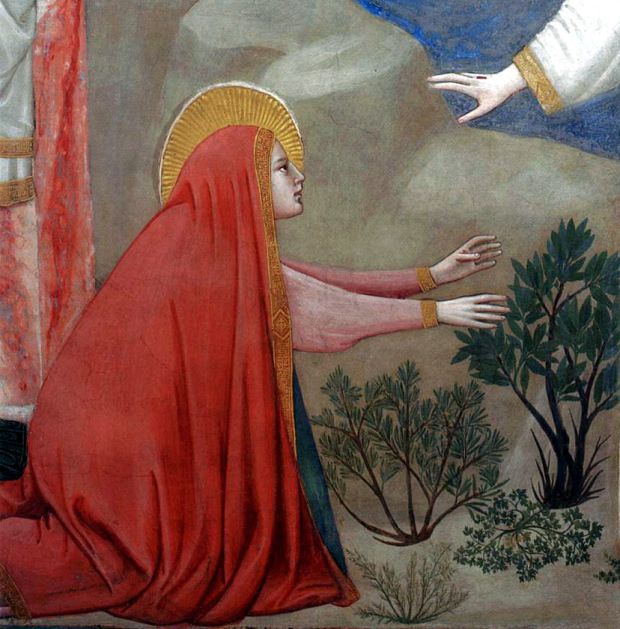 When the sixth-century Pope Gregory the Great conflated Mary Magdalene with the anonymous woman taken in adultery and the weeping sinner whose tears bathed the feet of her Lord, Magdalene became a compelling archetype for the forgiven sinner. The haggard penitent carved from a tree trunk by Donatello is famous for its rigorous rejection of idealized beauty. Both vanity and earthly delight have been stripped away. But this was an exception. 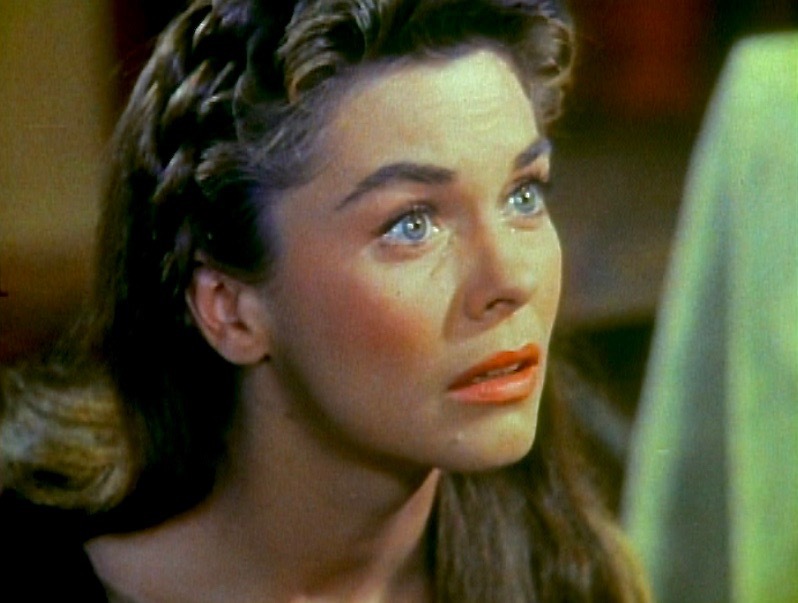 Most depictions of Magdalene retain a robust sensuality, like the close-up of Joanne Dru’s tear-stained face, gazing up at her Savior in my father’s 1954 Jesus film, Day of Triumph. Her riveting Technicolor image made a lasting impression on my ten-year-old self. and thought little or nothing of it. When the modern Magdalene puts her little girl to bed in “Christmas Eve,” she notices the baby Jesus is missing from the crèche they had set up in her room. a very high tower in the middle of the labyrinth. . .
and at the foot of the tower, the clay baby Jesus and a lamb. Where was Mary, and Joseph? endless corridors of the labyrinth––looking for their lost child. “Christmas Eve” could be a metonymy for the book’s overall interplay of the biblical and the contemporary, with the witty difference here of using the clay figures of a Christmas crèche instead of “real” characters. Even more representative of the whole is the poem’s image of endless search––not only for an absent Jesus, but for the inner truth of the seeker herself. then shot in the head? That was me. relieved to lie in the wreckage, ruined, physically undone. The worst had happened. What could hurt me then? I thought it was the worst, thought nothing worse could come. Then nothing did, and no one. Who indeed? We all know that hallway. We all long for that loving voice. The weeping Magdalene heard it by the garden tomb. “Mary,” he said. When she turned to respond, she rose from the dead. Howe’s haunting suite of poems, like Mark’s gospel, ends inconclusively. “What use / has it been? Somebody loved me / Somebody left. . .” And yet, “Whatever flooded into the world when / He died” relieves the wounding absence with traces of an impossible presence. This redemptive hope is perfectly expressed in “Magdalene at the Grave,” whose clear echo of the Easter appearance stories blesses us with a strange and consoling grace. On a late summer afternoon, the poet is driving to a cemetery to mourn a departed loved one. Whether she’s Mary remembering Jesus or Marie mourning an unnamed contemporary doesn’t matter. All mortal stories converge at the remembering place. When a heavy rain starts to fall, she decides to turn the car around and head for home. But once she reaches her driveway, she feels a strong compulsion (“as if something were pulling me”) to go back and complete her pilgrimage to the grave of her beloved. ––to kneel in the rain––I laughed out loud! the driver’s window rolled down. The tears I wept were not tears of grief. How many times must it happen before I believe? [i] Marie Howe, “Magdalene on Gethsemane,” in Magdalene: Poems (New York / London: W.W. Norton & Company, 2017), 46. All of Howe’s cited poems are from this volume. [ii] Interview in EDS Now (Spring 2013), p. 5. Episcopal Divinity School (EDS) in Cambridge, MA, was my seminary. [iii] “Magdalene Afterwards,” in Howe, 48. [iv] “Adaptation,” in Howe, 79-80. [v] “Magdalene––The Seven Devils,” in Howe, 16, 18. [vi] “The Teacher,” in Howe, 69. [vii] “The Teacher,” in Howe, 42-43. [viii] One of 7 untitled interludes in Howe, 54.